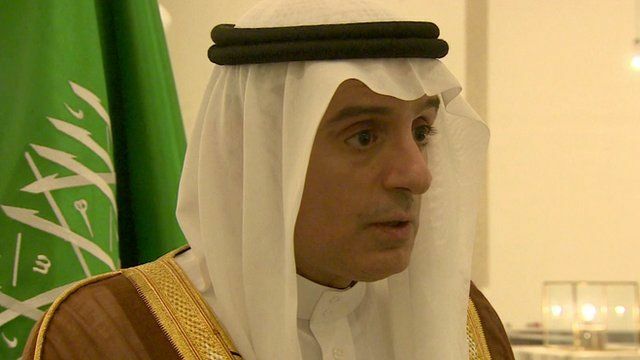 Saudi FM: No doubt Assad will go Jump to media player There is "no doubt" Syrian President Bashar al-Assad "will go", Saudi Foreign Minister Adel al-Jubeir has said ahead of talks in Vienna. Iran to join Syria talks in Vienna Jump to media player The US is intensifying diplomatic efforts to end the "hell" of Syria's civil war even as it increases support for moderate rebels, US Secretary of State John Kerry has said. 'Cluster bomb' chaos as Syrians flee Jump to media player First-hand testimonies of the Syrian offensive near Aleppo which sent residents rushing towards the Turkish border for safety. Journalist finds friend in refugee camp Jump to media player BBC Arabic producer Mahmoud Ali Hamad travelled to a refugee camp in Jordan, where he found his old school friends and next door neighbours stuck there. Russia's military hardware in Syria Jump to media player Details of Russia's cutting edge military technology being deployed in Syria. Assad makes secret trip to Russia Jump to media player Syria's President Bashar al-Assad has visited Moscow on his first overseas trip since the civil war broke out in his country in 2011. Drone video reveals Syria devastation Jump to media player Video filmed by a drone emerges showing fighting in a suburb of the Syrian capital Damascus, and the scale of the devastation in the city. There is "no doubt" Syrian President Bashar al-Assad "will go", Saudi Foreign Minister Adel al-Jubeir has said ahead of talks in Vienna. Foreign ministers from countries including Russia, Saudi Arabia, Iran, the US and Turkey will attend the meeting to try and find a solution to the long-running civil war.